Ruffwear Wind Sprinter Jacket is a wind jacket for dogs. This ultralight jacket is made from durable nylon and protects your dog from stormy winds. The collar on the jacket offers extra protection from the weather. The Wind Sprinter Jacket from Ruffwear is a special jacket for dogs that enjoy going on an adventure with their owners. This wind jacket will protect your dog from stormy winds. Thanks to the reflective edges, your dog will also be highly visible in the dark. The jacket is made of nylon and is extremely lightweight. Thanks to the DWR finish (Durable and Water-resistant), the jacket is also suitable for use in light rain. Thanks to the leg straps, the wind jacket also stays in place. The jacket comes with a storm collar. The storm collar offers extra protection in bad weather. The jacket can generally be placed over the top of most harnesses. Should the sun start shining again, the jacket is easy to put away. The storm collar also functions as a storage bag for the wind jacket. What if the Ruffwear Wind Sprinter Jacket doesn't fit? 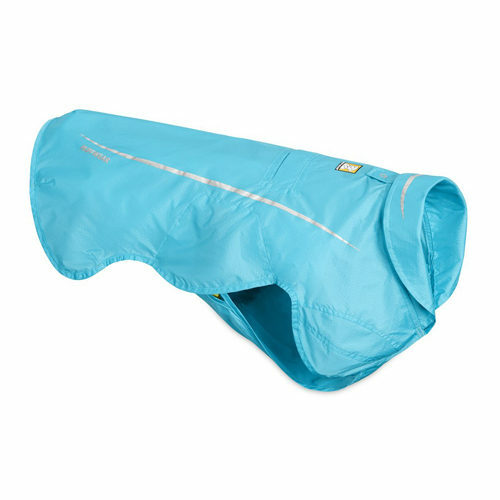 The Wind Sprinter Jacket can be removed from the packaging and held up next to your pet in order to check whether it fits. For hygiene reasons, the jacket cannot be returned if it has come into contact with your pet. If we find that the returned jacket is stained, worn, contains dog hair, smells or has been washed after use, we cannot return the product to you. In this event, it will be donated to a charity (local shelter). As we are often confronted with products that are returned in a less than new condition, we have to apply these rules for fitting and/or returning products. Have you used Ruffwear Wind Sprinter Jacket before? Let us know what you think about this product.